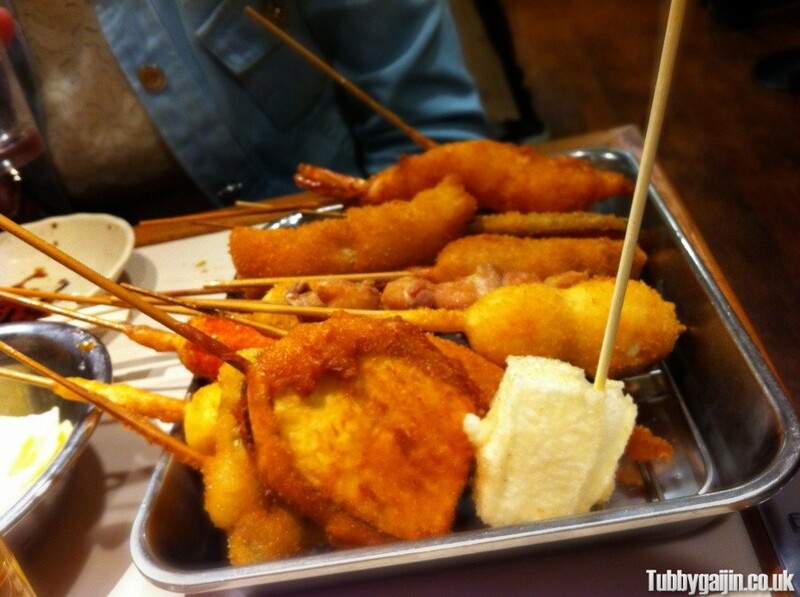 Kushikatsu(串カツ) are deep-fried skewers of… almost anything, served with a dipping sauce. They’re a specialty here in Osaka, and you’ll find plenty of restaurants serving this tasty food around the Shinsekai area. 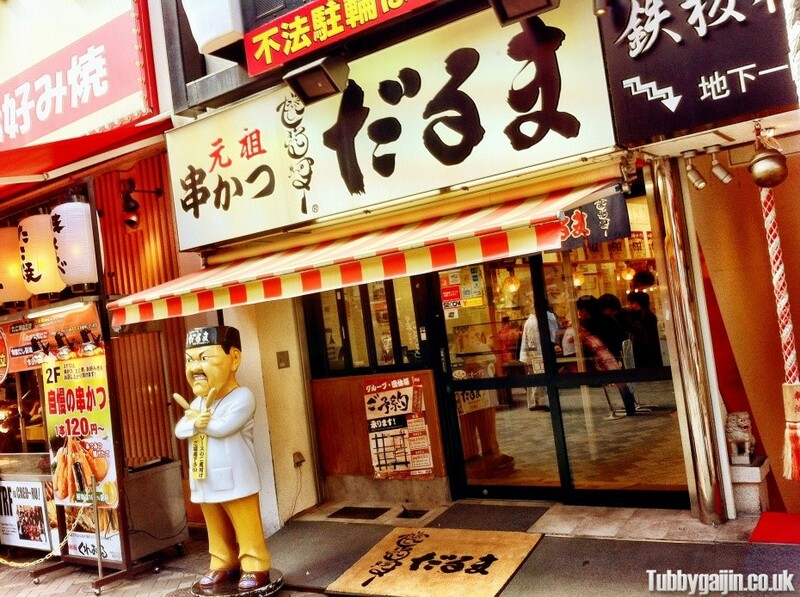 One of the best-known restaurants is Kushikatsu Daruma, which opened way back in 1929 has been owned and run by the same family for four generations, these days they have a number of establishments in Osaka. I love kushikatsu and I’ve been way overdue to visit Daruma, but I’m happy to say I’ve finally been! 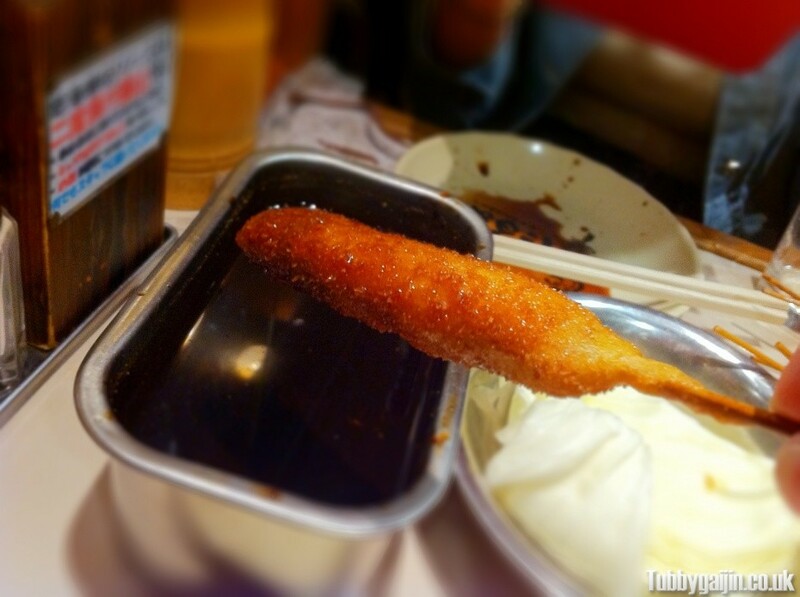 Inside, the air was thick with the smell of fried food and the sweet kushikatsu sauce. Daruma use a special recipe consisting of: secret batter, tasty oil and sauce – this unique taste is what makes them famous! Inside wasn’t anything too special looking, but you go for the food, not the decor! You can buy single skewers which cost between ¥120 to ¥240 each, or get one of the sets – I went for the Hozenji set which was ¥1800 for twelve skewers and a side order of edamame beans. You’ll find a huge vat of sauce on every table, so dip away but don’t forget the golden rule of kushikatsu… no double dipping!. 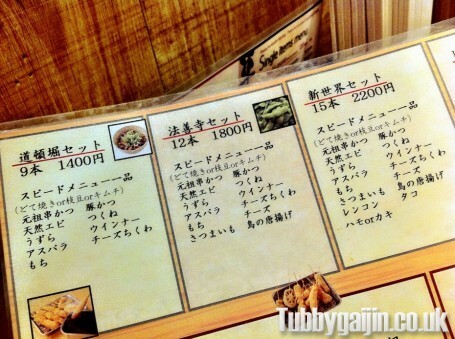 All of our kushi was so tasty, I can see why people queue for so long to eat at this place. Maybe I’ll check out the original Shinsekai restaurant next time. Here’s an awesome promotional video for Daruma I found while trawling youtube for Yakuza 5 footage! 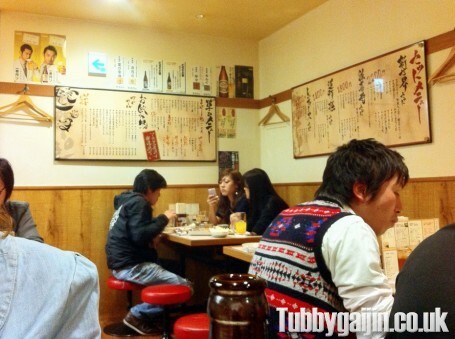 Dotobori Daruma is open every day, from 11:30 to 22:30, enjoy!